Hello Friends, Happy Friday! I hope you have had a great week. I was prevented from posting earlier today because… (get this)… Miss Baby is home from school today, and she had to use my computer to work on something for a poster! I feel like I am entering another stage in my journey of motherhood in that I am having to share things with her now. Computer now… what’s next? Car?! Thank you to all of you who played along in my Hamilton giveaway. The winner is Gini (#100)! Congrats!! Gini, I have sent you an email asking for your shipping address. Please respond asap, and I will have Windham send out the FQ Bundle to you! And a great shout out to Windham for being so generous… trust me, more giveaways are in the works!!! 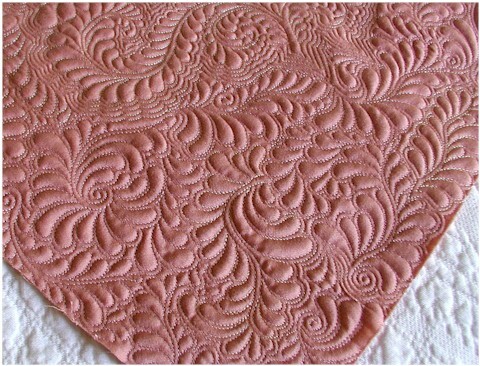 If you recall, I had designed 2 free to used patterns to support this fabric line. 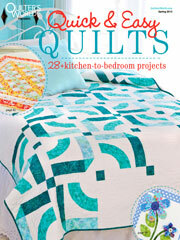 Quilt kits are also available for the designs. #1. Schuyler Sisters. Free pattern here. Kits available here. #2. Eliza. Free Pattern here. Kits available here. 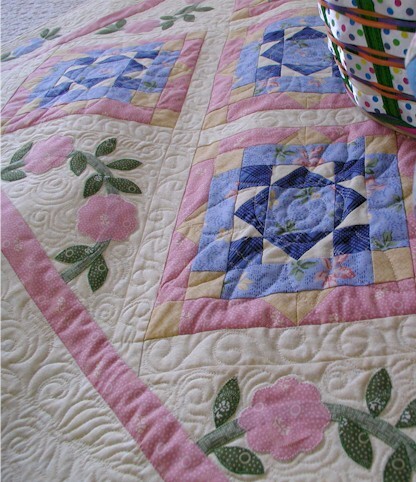 Some of you have inquired about the names of the quilts. So I asked my friends at Windham Fabrics. The fabric line Hamilton is named after Elizabeth Schuyler Hamilton, the wife of Alexander Hamilton. You can read more about her here. 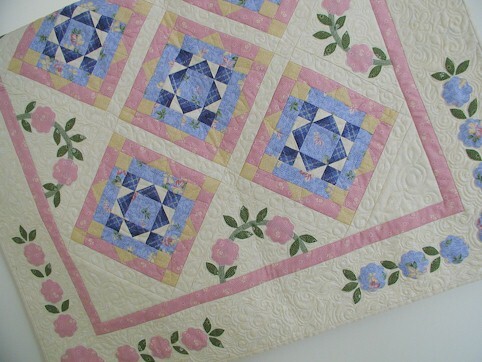 Mrs. Hamilton’s nickname was Eliza, thus the name of the pinwheel quilt. 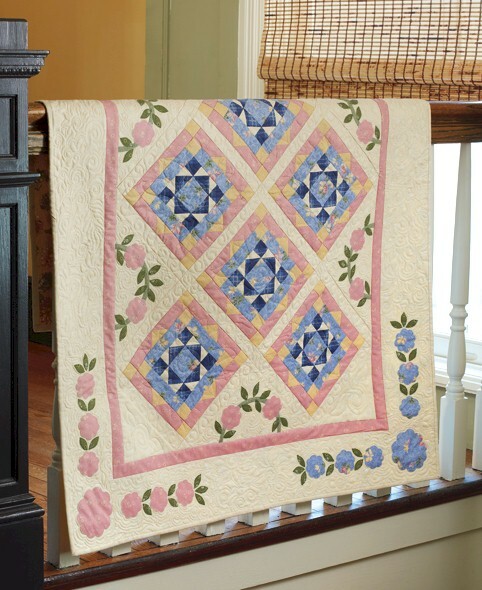 The Windham team also wanted to give a nod to the close relationship Mrs. Hamilton had with her sisters, thus the star quilt Schuyler Sisters. I thought the back story was really neat, don’t you? 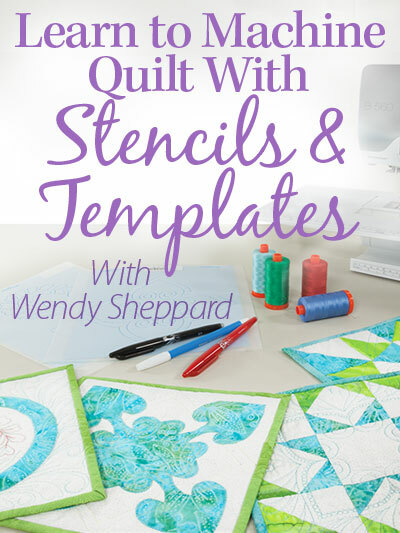 Meanwhile, I spotted quite a few Windham fabric quilt kits on Keepsake Quilting that were designed by yours truly — As you can see, Windham Fabrics has kept me quite busy! 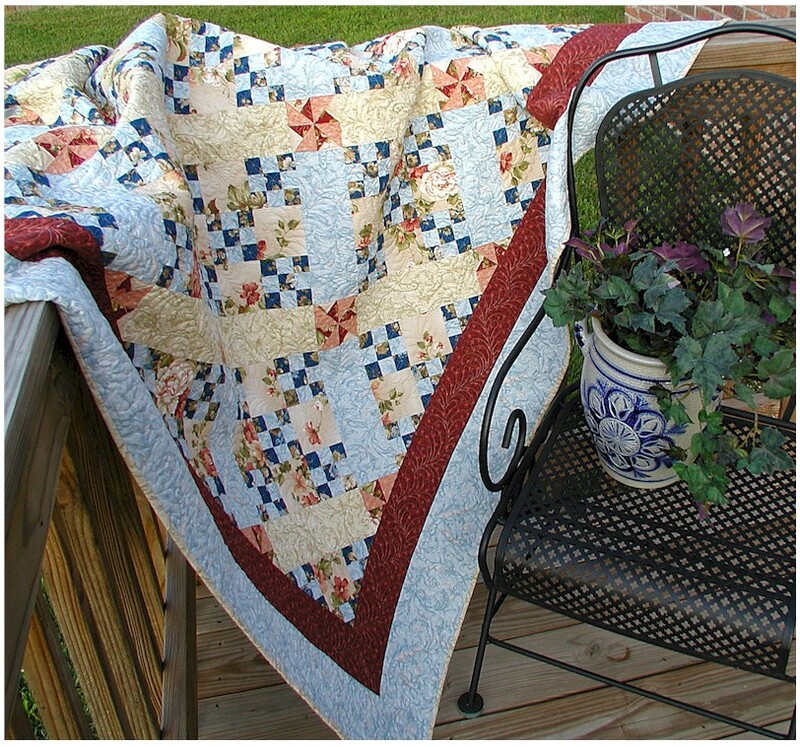 :) In case you would like to support Windham Fabrics…. 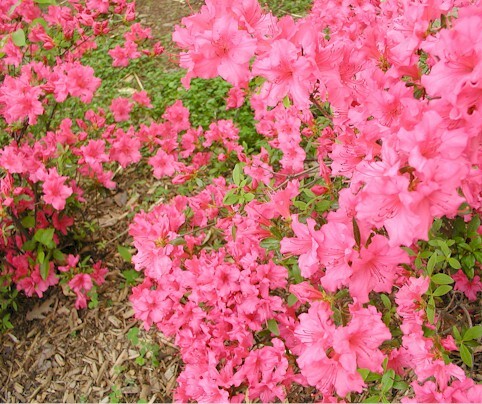 Flowering Tree (52″ x 52″) on sale now for $69.99. Click here to purchase. 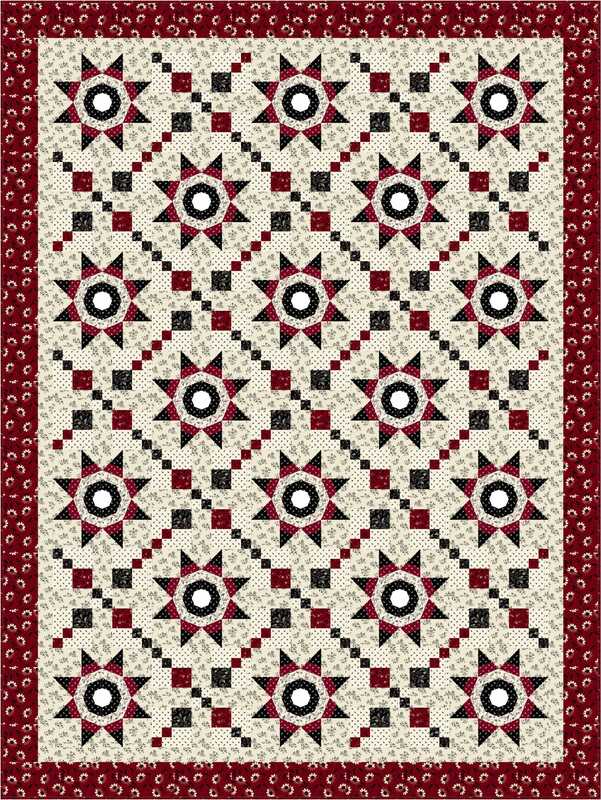 Medallion Star (61″ x 76″) on sale now for $79.99. Click here to purchase. 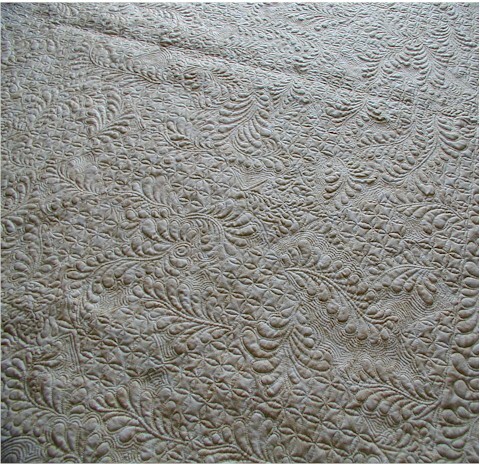 Compass Star (60″ x 80″). Click here to purchase. 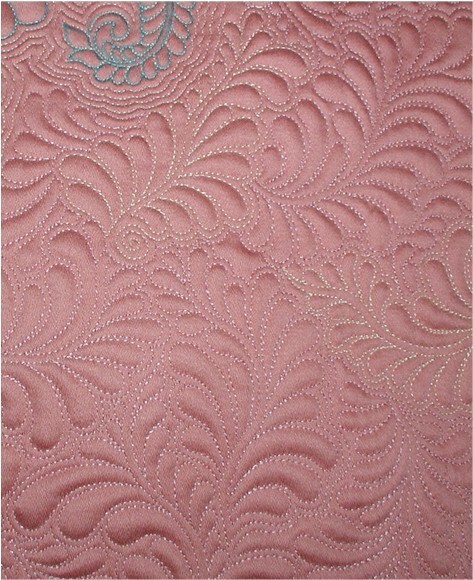 Northern Star (67″ x 92″). Click here to purchase. Color Coded (54″ x 54″). Click here to purchase. Cat Tales (80″ x 96″). Click here to purchase. 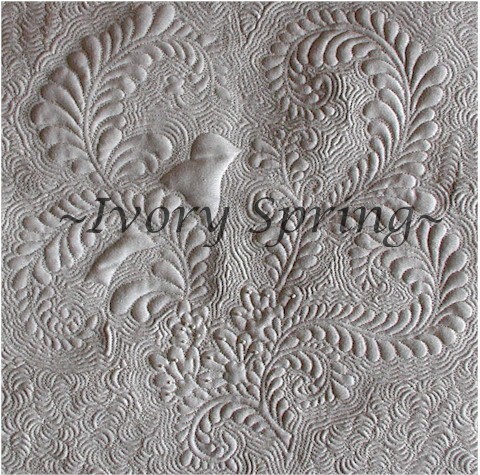 Garden Cottage (45″ x 54″). Click here to purchase. Well, that’s all for now, Friends! I hope you have a lovely weekend!! Hello Friends, and Happy New Year to you! I hope you and yours had a restful and enjoyable break over Christmas and New Year. WOW — I can’t believe we are already into the 6th day of the new year! 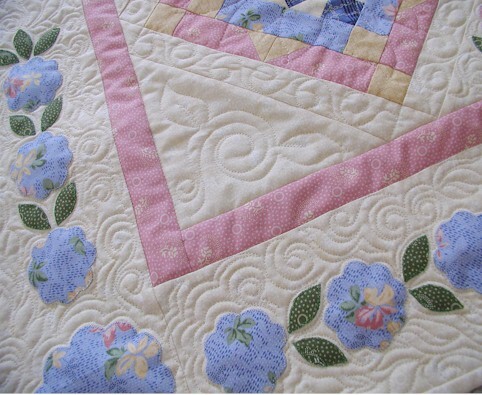 I hope we will have fun with each other as quilting buddies this new year. 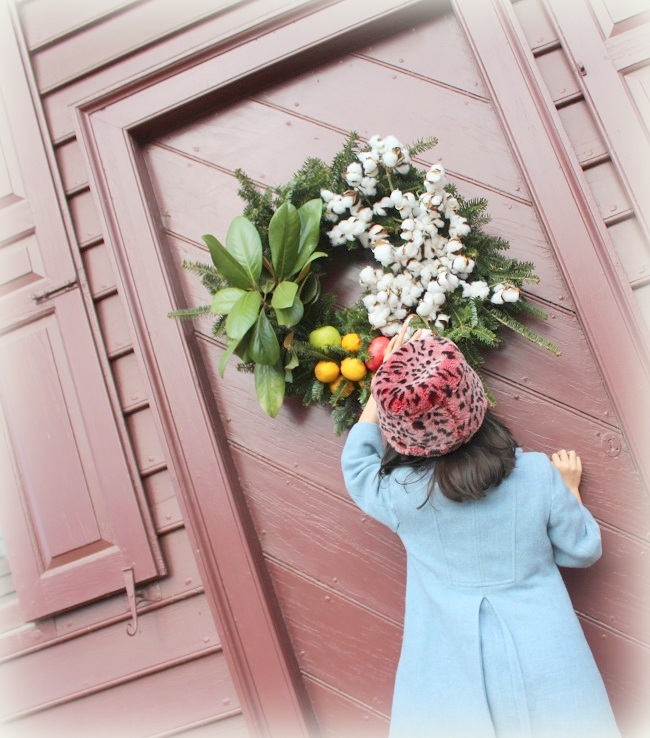 Venturing into the New Year is like stepping through a door… and finding out what awaits on the other side. Things are already shaping up for me this New Year. The following samples of what’s to come in the new year… so, you can see I have been working, haha! But then if you have known me for any length of time, I make a point to not ever complain about work. Miss Baby did manage a last minute quick stitching finish before 2017. So, this will be the first ornament she hangs up on our Christmas tree this year. 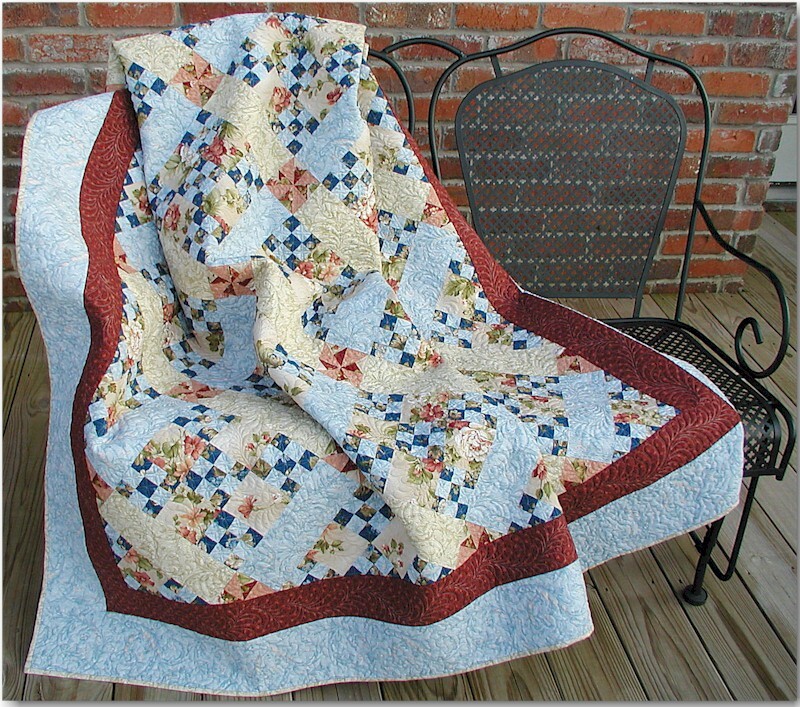 So, here are a couple of New Year-ish quilts! 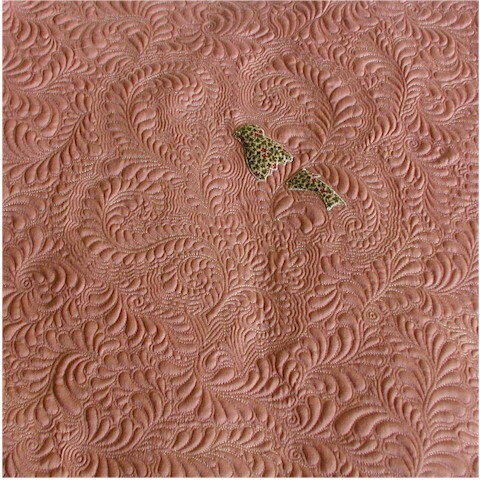 Making New Friends in Fons & Porter’s Quilting Quickly (November/December 2016), using Windham’s Grace charm pack. 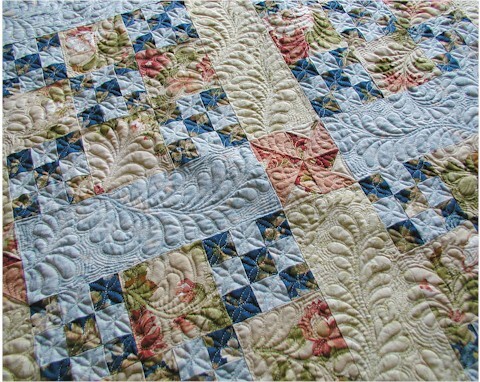 You can watch a tutorial on how to make this quilt here. 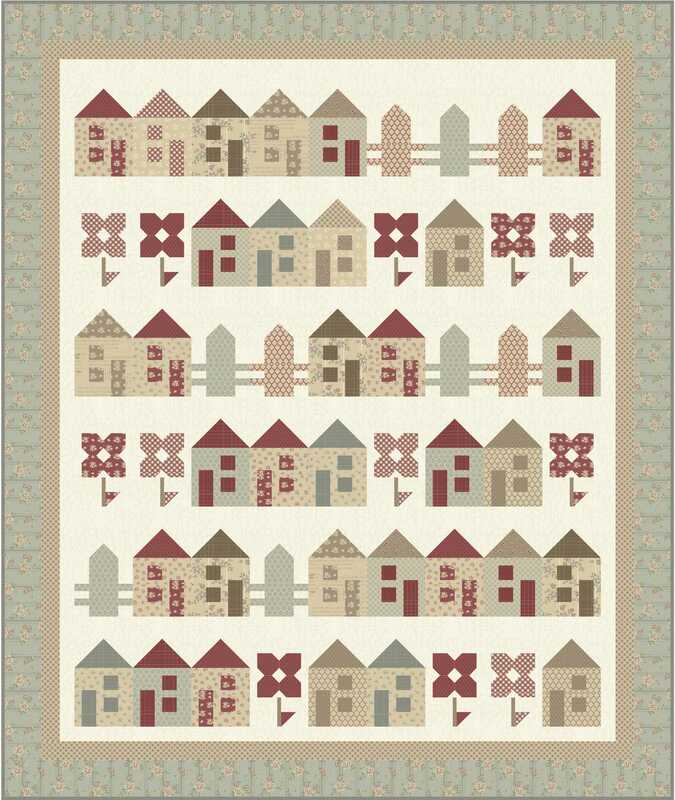 Day Break is a design using Hoffman fabrics, and exclusive kits are available from Keepsake Quilting. 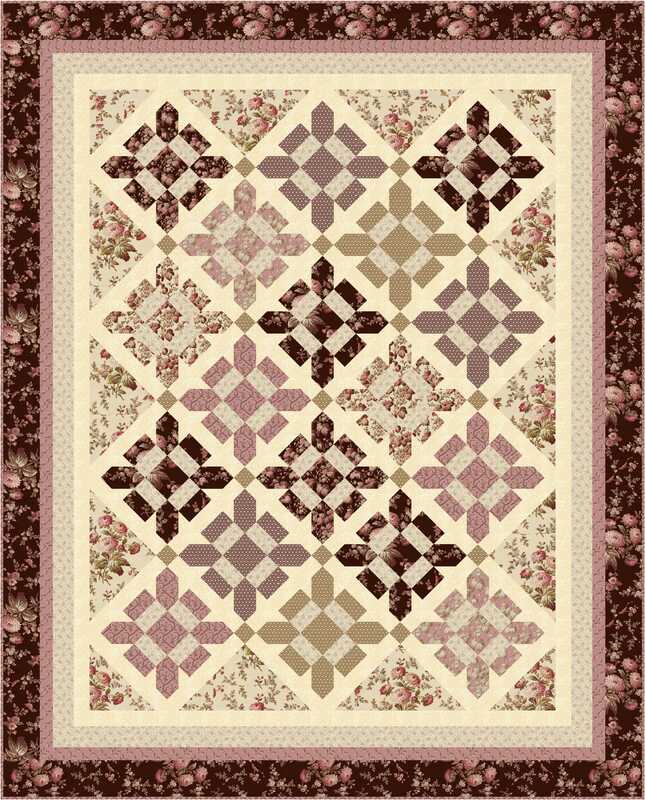 Click here to purchase quilt kits. 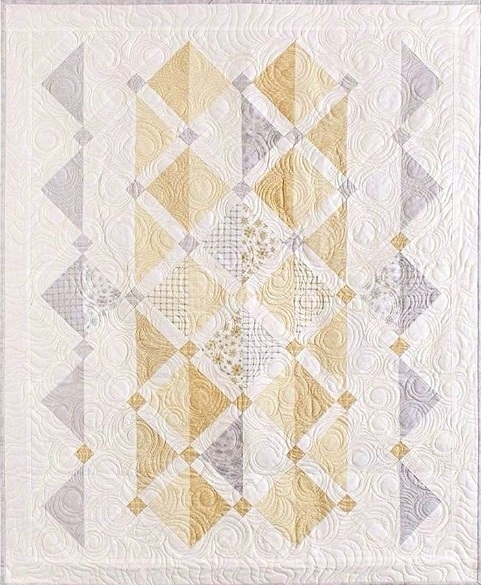 I was asked if the construction of this quilt top involves Y-seams — no Y-seams, just the good ol’ half-square-triangles! 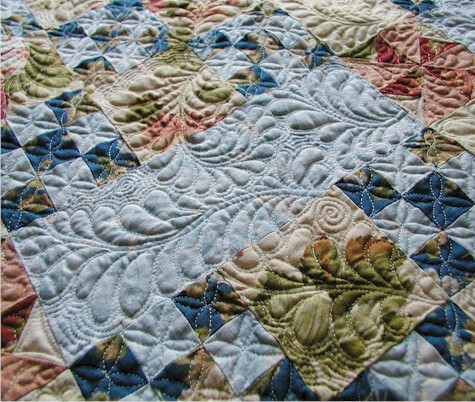 You know me, I avoid complicated piecing for the most part, hehe. 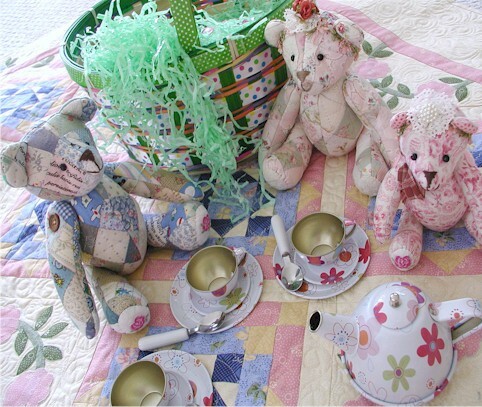 SEW-ALONG – who wants to join? 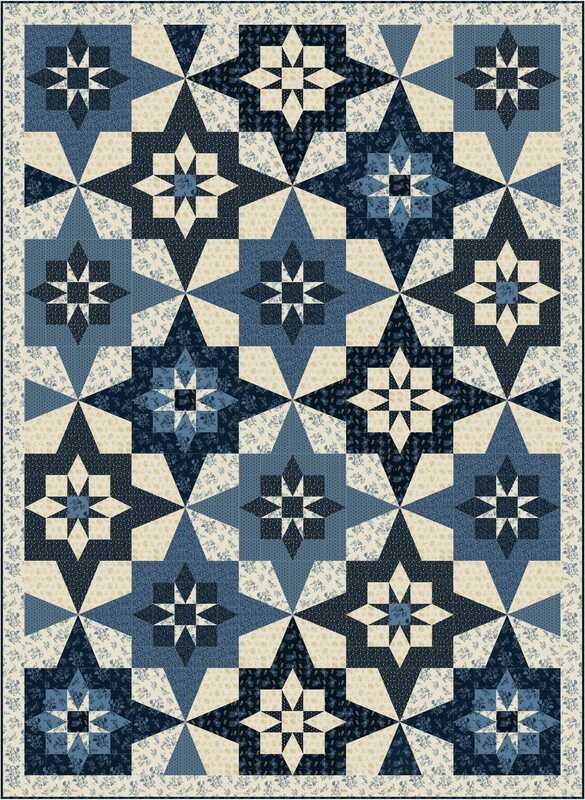 Besides the usual, this year, I have a goal to make my Spring on Bleecker Street quilt for myself! 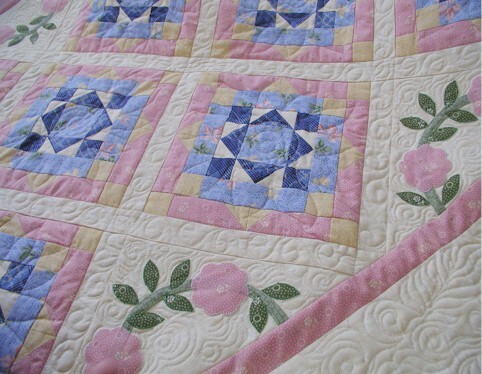 You see, I didn’t get to keep the original quilt displayed at Quilt Market last fall. 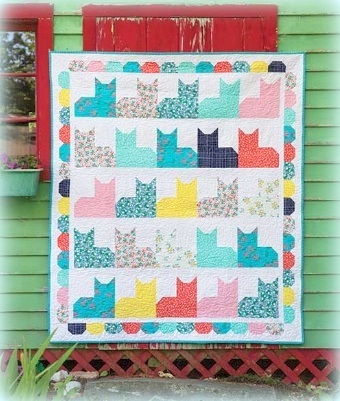 And I am looking for sewing buddies on this project. 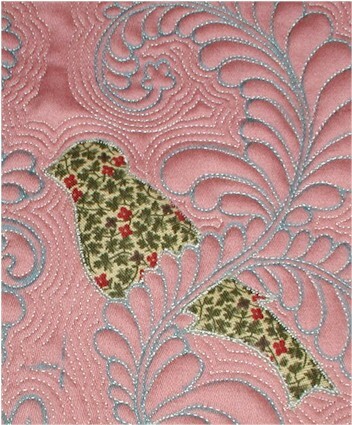 I will be hosting a sew-along starting in Feb. I would love for you to join along. 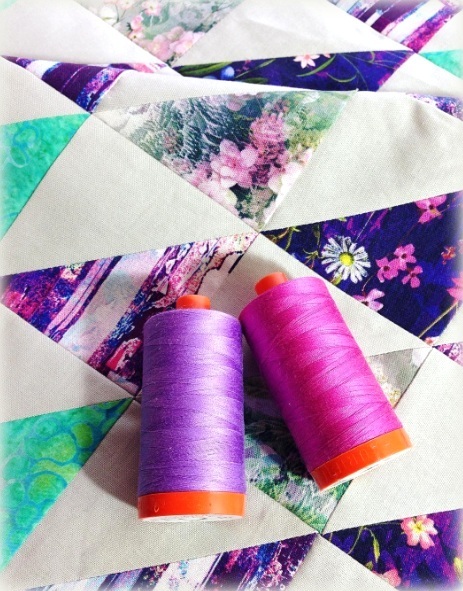 If you haven’t already, you may download the instructions for this collage quilt here. 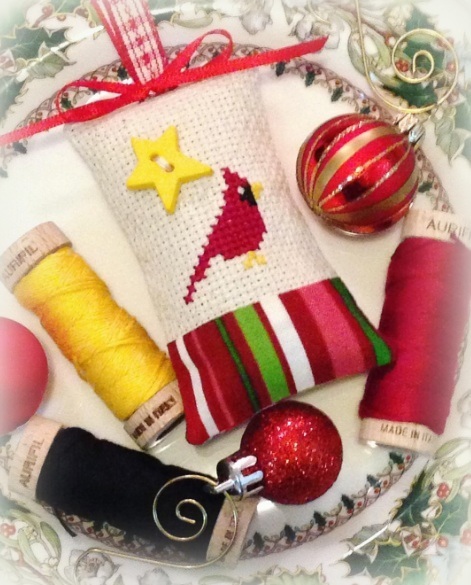 Please email me with the subject tilte “Sew Along” to let me know you would be interested to join in the fun. 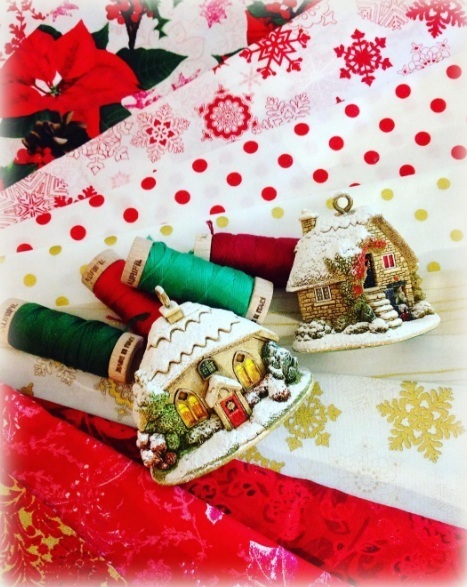 The fabric kits (fabric and floss) are available from http://thimblemouseandspouse.com. I know that for a fact, because Lynn announced that she had ordered the fabrics and floss. Give her a call or email her!!! 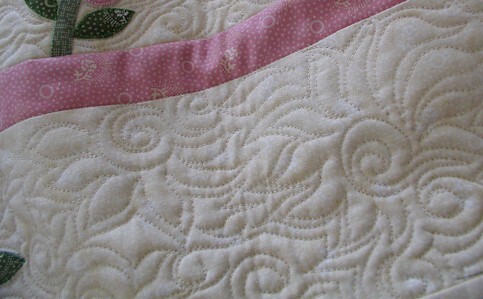 I will share more about the schedule for sew-along next week, and how it’s going to work next week. Meanwhile, Christmas isn’t quite over in my little corner of the world. 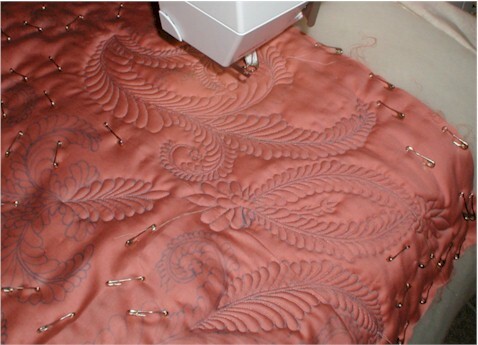 I will be working on these fabrics!!! One thing I can promise you for 2017 is that I have MANY Christmas projects in the works. 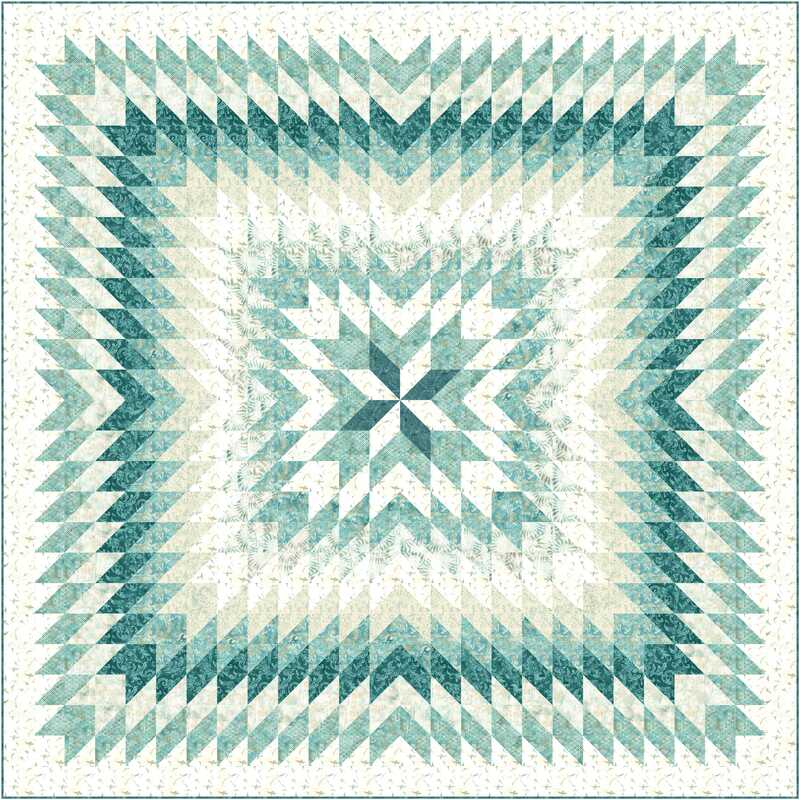 MYSTERY QUILT-ALONG, anyone? 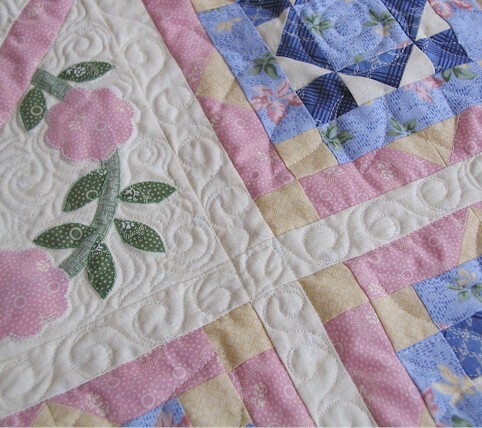 There will also be a mystery quilt-along being planned for this summer. 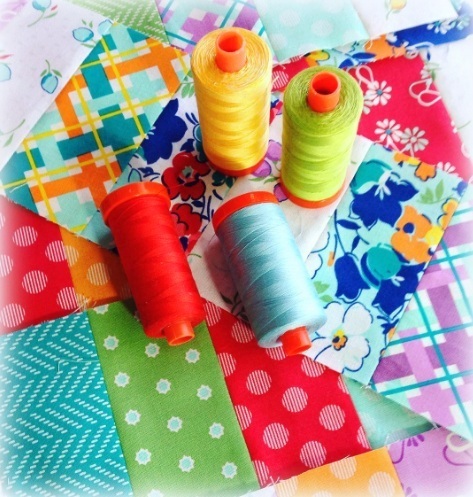 I am trying to see which you prefer — would you prefer a mystery quilt-along using scraps or a specific fabric line? Alrightie, Friends…. God’s blessings to all of you for a fanta-bulous year! And have a wonderful weekend. p.s. I am still trying to catch up on emails you had sent me over Christmas break. We were gone for a bit, and I am just now working on replying my email inbox and cleaning it out. 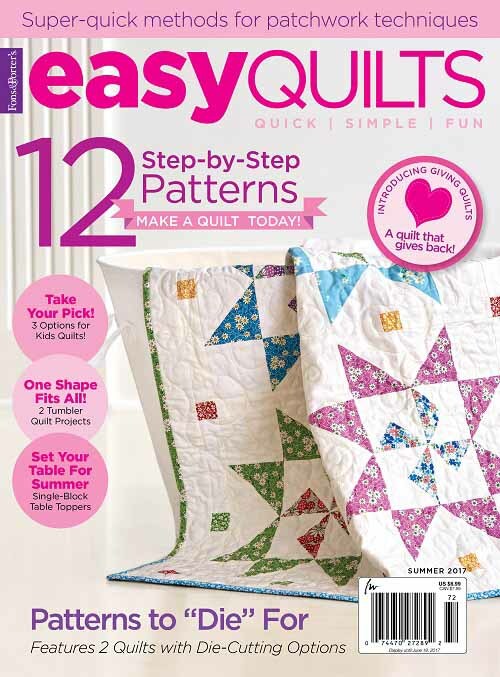 Incidentally, you may now purchase patterns and kits of my Maribel designs from Craft of Quilting. Click here for Smokey and Friends Kit. 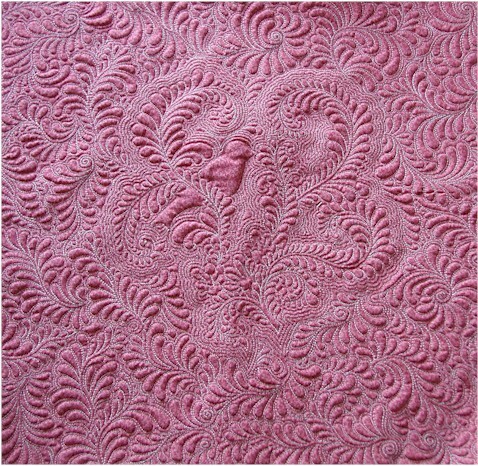 Click here for just the pattern. 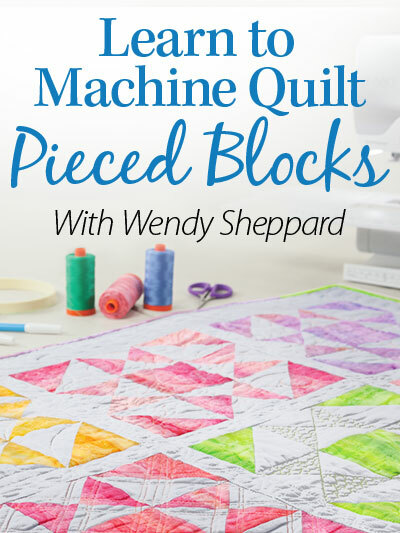 Click here for Our Block Kit. 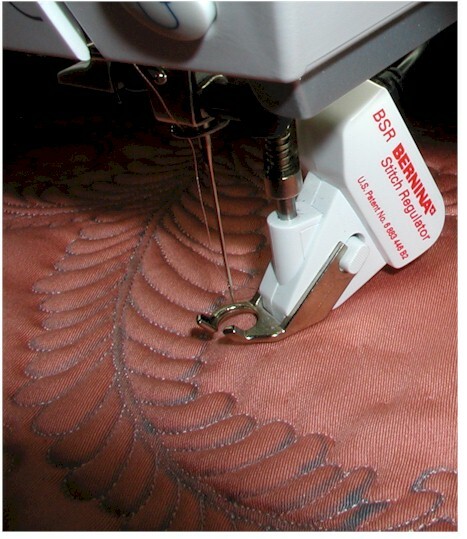 Click here for the pattern only. Good day, everyone! I hope you have had a good start to your week. I will be playing catch up this week on top of my LONG list of things to accomplished. I am swamped! 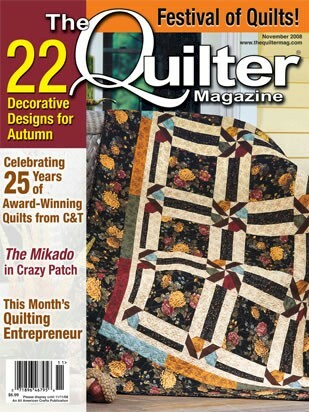 Besides Cottage Garden, my “Sentimentally Yours” Quilt is also featured in the November 2009 issue of “The Quilter“. 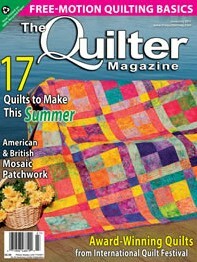 Please go to www.heartbeatquilts.com for kits. 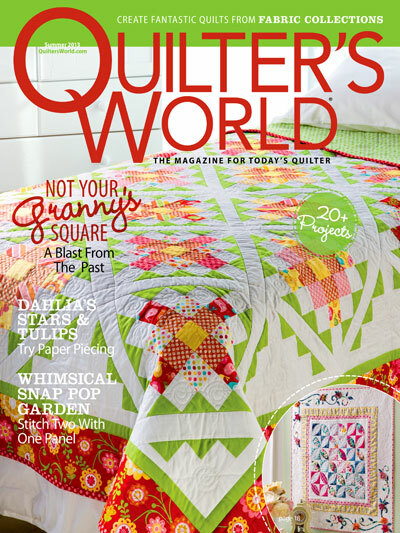 I received a delightful email from Nancy of Ohio complimenting on my quilts she saw in this very issue of “The Quilter”. What an honor! I always love to hear from readers, and certainly appreciate them taking the time to write. So keep them coming Well, I’d better get going here! I will catch up with you later. Tootles! 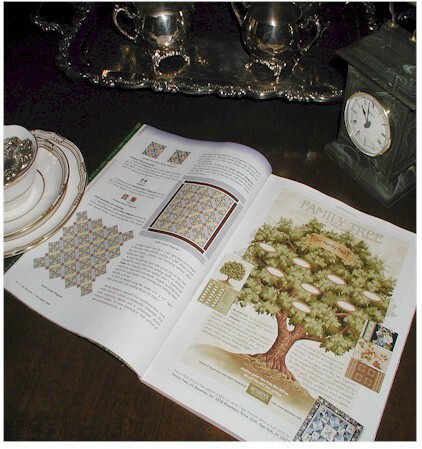 Right after the article on the “Pieceful Garden” is Benartex advertising the VERY same fabric collection (FAMILY TREE by Pam Lindquist) I had used for the quilt. Now, how cool is that?! 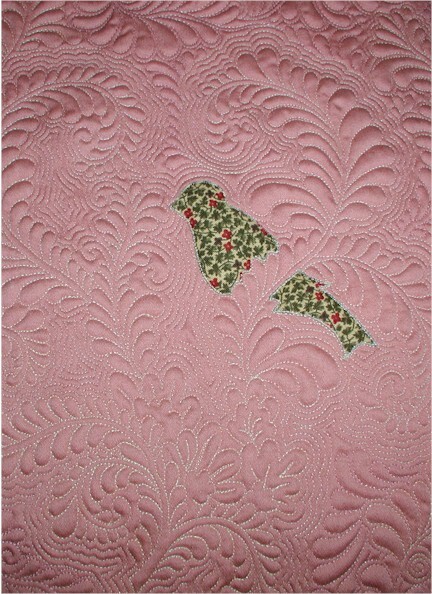 The sample quilt is currently on display at Rogers Sewing Center, my “home-sweet sewing-home”. So, if you happen to find yourself in Northwest Arkansas, do hop on in and meet the sweet people there. 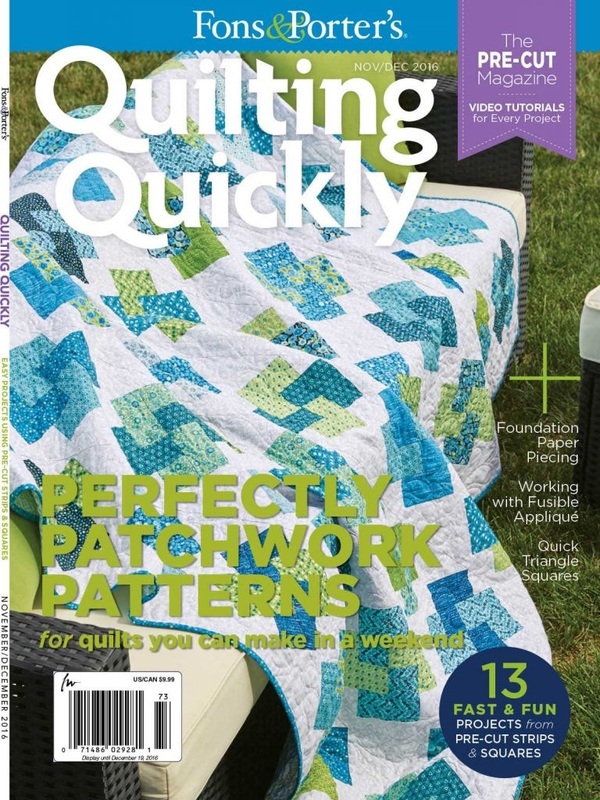 As a contributing quilter in the magazine, I was MORE than anxious to thumb through the magazine to see exactly how my quilt is being featured in the magazine. 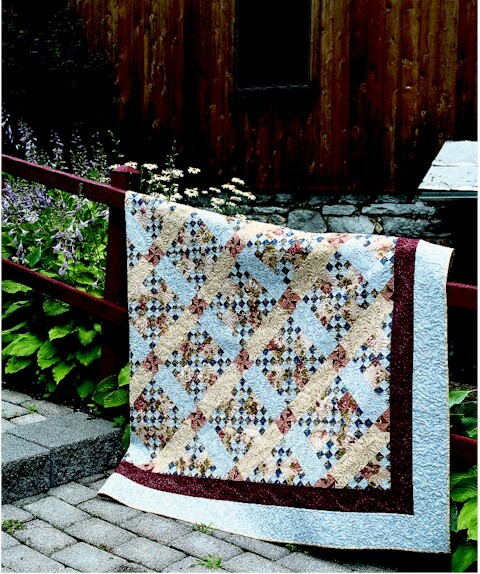 I have to say I am thoroughly impressed by Laurette Koserowski (the editor) and her staff for a job very very well done, not only in featuring my quilt in such an attractive way, but also the other quilt projects as well. 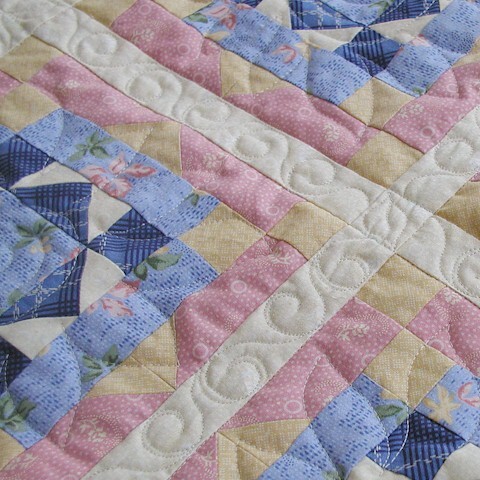 Another reason I like the “The Quilter” is because I feel like much thought is put into the presentation of each quilt project — the details and accents are simply amazing. 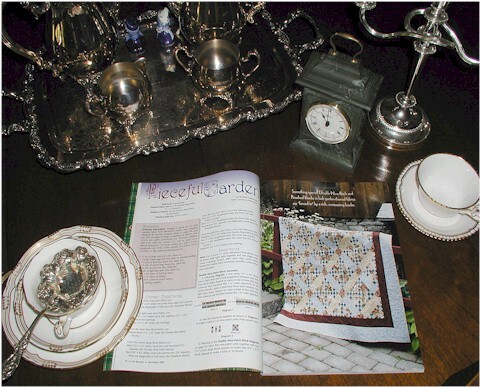 To me, the magazine also serves as an excellent resource for quilters to get ideas on how to incorporate quilts in home decorating. 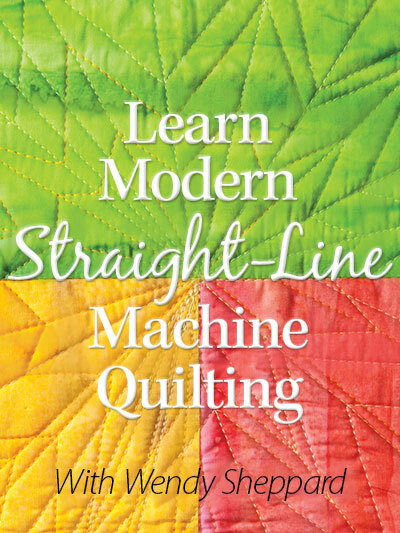 My quilting friends, I hope you are planning to get your own copy — you will be inspired, I promise! 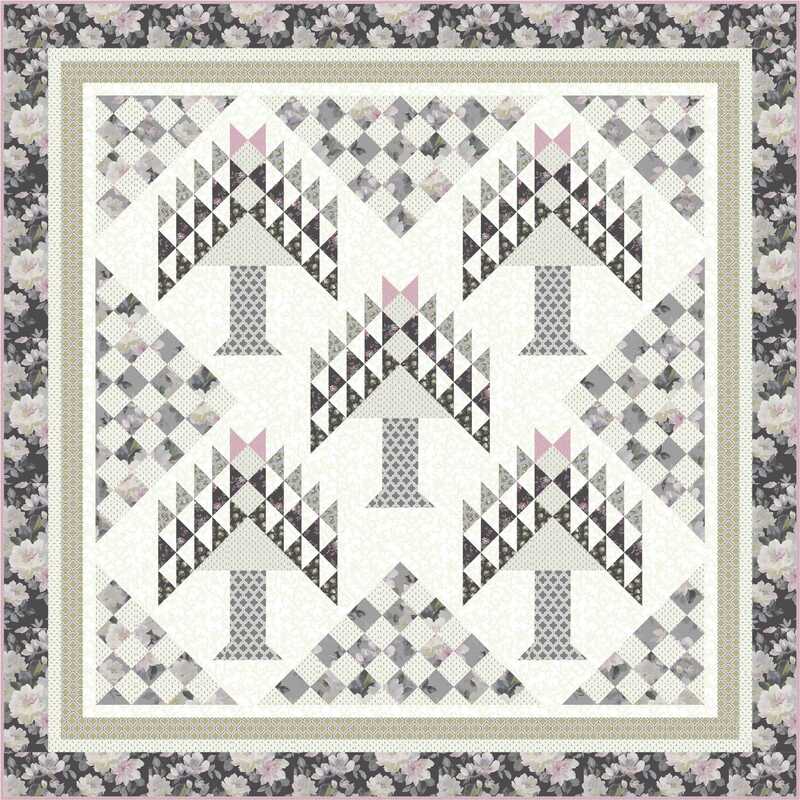 You may click here to order the kit to construct the quilt top (includes binding). 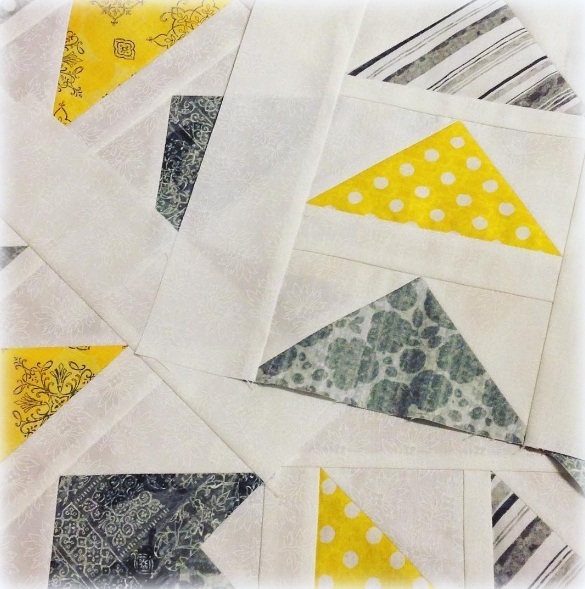 Don’t leave without clicking here to see what you can do with the kit scraps. 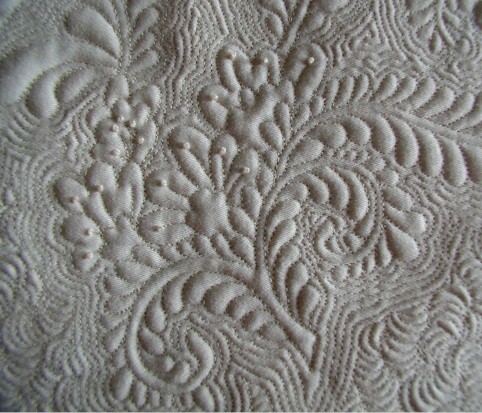 UPDATE (9/11/2008) — my European Sham Pillow, made with kit scraps, is now COMPLETE!! UPDATE (9/14/2008) — my other pillow made with kit scraps is now also COMPLETE!! 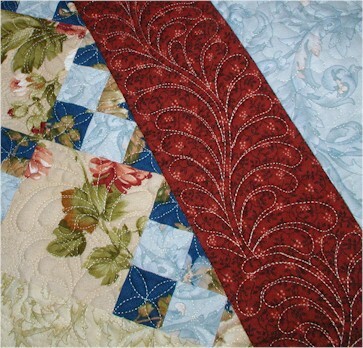 UPDATE (9/16/2008) — click here to win a pillow made with the kit scraps to match your quilt!! “Where they make the sausage” and News! Honestly, I can’t decide which looks better – the front or the back. I like the “embossed” look of the front, but also like the better contrast of the back. So, for the first time in my quilting life, I am not going to attach a hanging sleeve or a label on the back (*gasp*) — just so that I can have a reversible wallhanging to go with the original Song of Williamsburg by the stairwell! 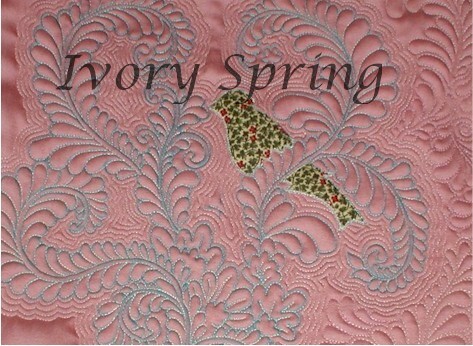 Now, I am off to attaching the binding to finish this baby up for real! Just out of curiosity — what is your vote? Front or Back? Meanwhile, you all have a wonderful day! p.s. We did get some rain today!!! 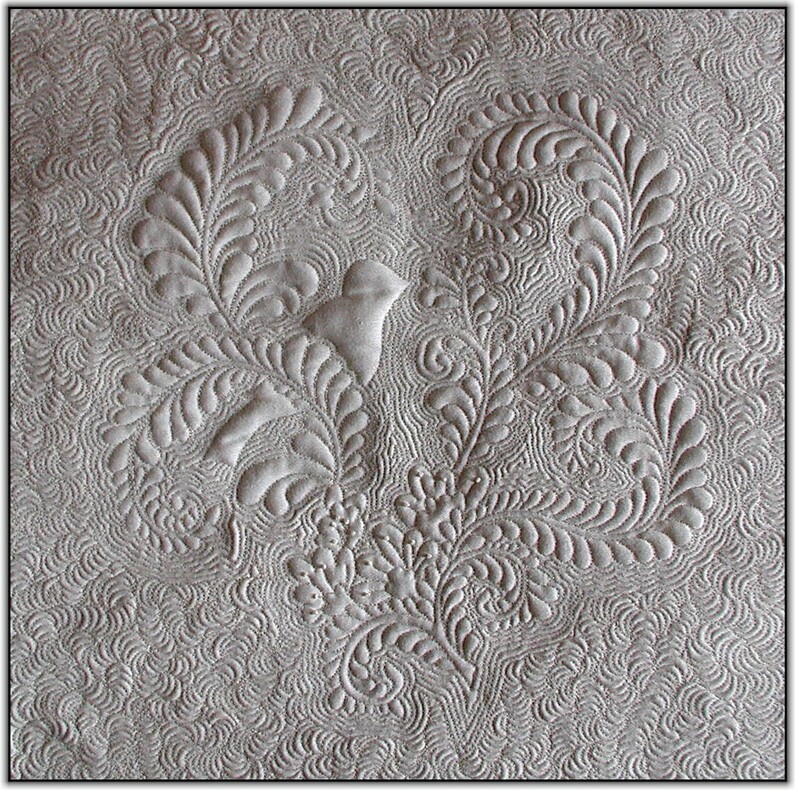 The wholecloth-style quilting is one of my favorite kinds of quilting because one could really showcase some dense and beautiful feather quilting motifs. Now that it’s completed, I am pleased to show you “Song of Williamsburg”. Was this like anything you had imagined when you read Border Smart a few days ago? 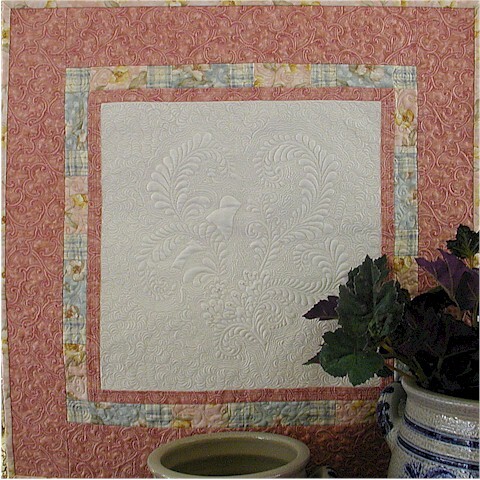 The quilting motif in the center cotton sateen block is original and was inspired by an 18th century bird bottle found in Colonial America. 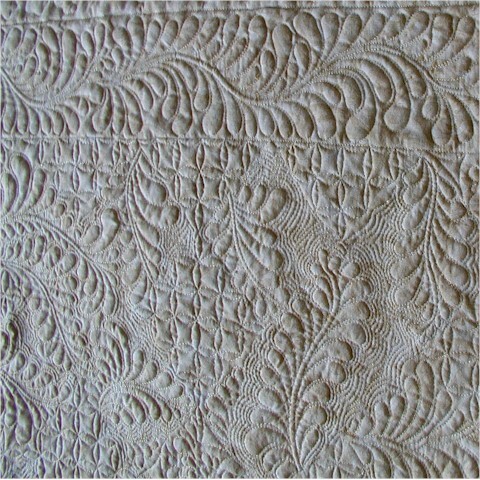 The entire quilt is quilted with silk thread. You can see from the closeup shot that I had added some French knots for added interest to the piece. I wish you a beautiful and blessed day, brightened by bird-ly songs! p.s. 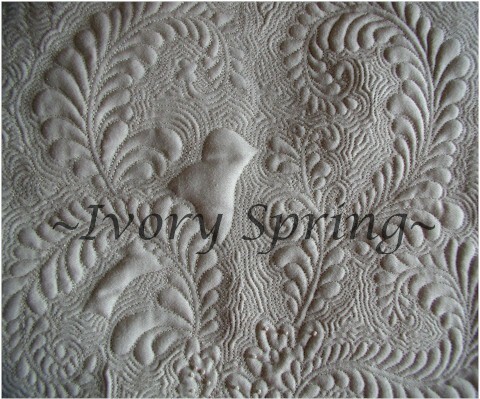 The pattern of the quilting motif will be available for purchase some time next week.